And because this worked out so well last week…we’re going to do it again this week! This post is going to be your Hub for all things week 3 of the Greek Life Event. Just like week 2, I’ll leave this post sticky’d to the top of the page. So if you have a question/comment/concern/tip to share about Week 3 of Greek Life, this is the place to do it. And just like last week, when we post the usual info I’ll link it in the post below. So this post will continue to be your Hub for all things Week 3! Bunny hopping in here… yes… it is me… kinda here… jumping in to help all I can, but still not back to full abilities just yet. I will put my information next to TinyCo’s in RED. So just keep an eye out for the updates. How do I begin the third phase of Greek Life? 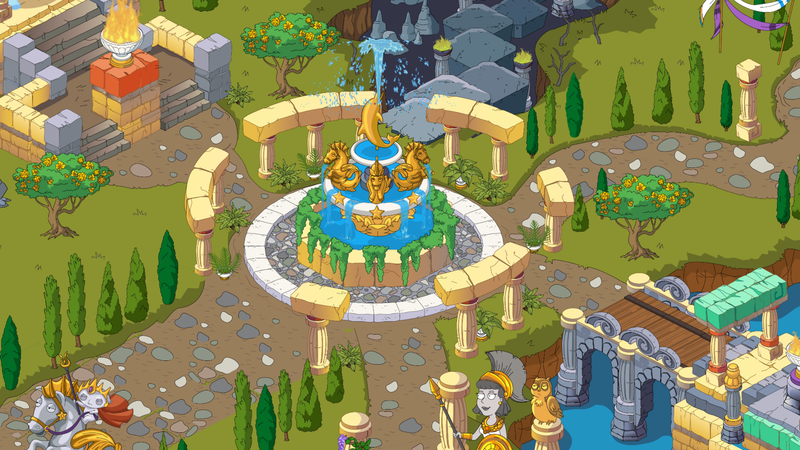 You will need to upgrade the Fountain and complete Give It Up to the Gods Pt. 9 before you can begin the third phase of Greek Life. 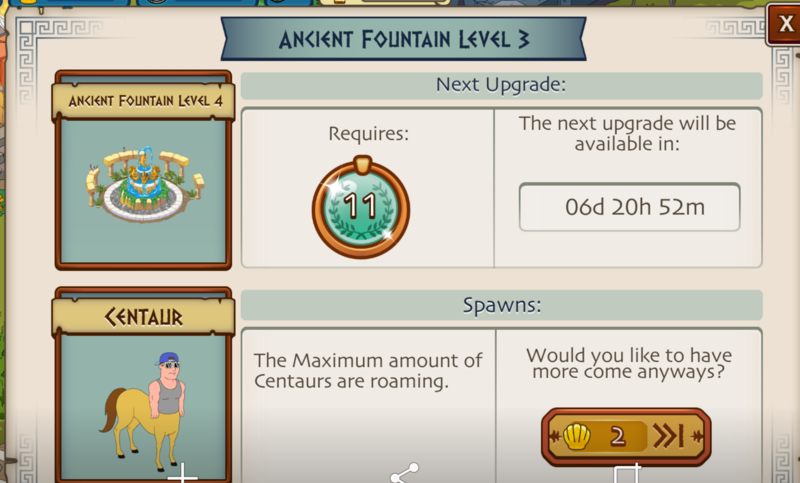 Make sure you tap on the Fountain once you see the #3 to upgrade it. When do Reverse Mermaids begin appearing? Reverse Mermaids will begin appearing once you reach Party Like a God Pt. 1 (the main quest line for phase 3). How do I clear Reverse Mermaids? You will need 1 Seafoam Spell to create Seafoam Offerings at the Campus Altar. Seafoam Offerings will take 30 minutes to craft. After you have crafted the Seafoam Offering, place it in the path of a Reverse Mermaid to clear it. The area that the Seafoam Offering covers will be shown with a green circle. If a Reverse Mermaid enters this circle, it will turn purple. Tap the checkmark to shoot the Reverse Mermaid while it is purple to clear it. How do I unlock Billy Finn? Billy Finn is available in the Argo which you can find at the University Store. Billy Finn is available until Thursday, June 9 at 10 AM, PDT. If he is not completely unlocked, he will disappear from the game at that time. If he is unlocked before the event ends, you will be able to continue his quests after the event has ended. How do I unlock Neptune? Neptune is available at the University Store. You will have 5 days to purchase him after viewing the University Store in phase 3, or he will disappear from the game at that time. How do I make offerings to Neptune? 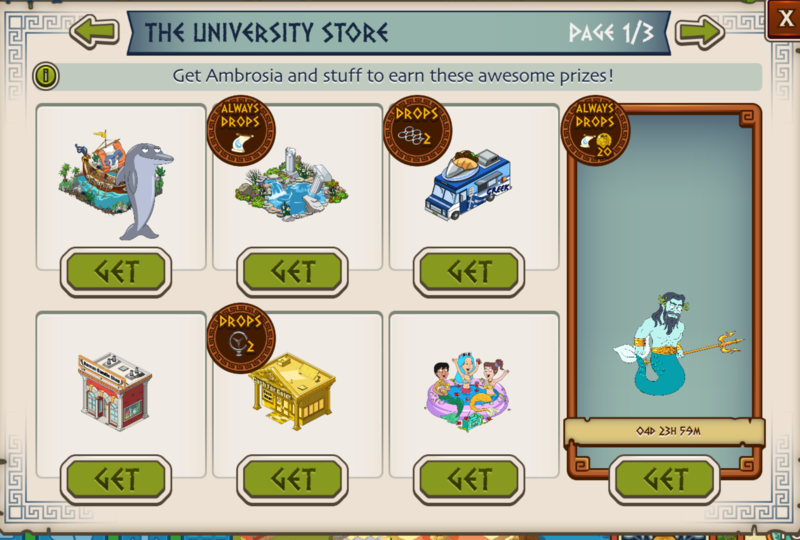 Just like previously, he is SEPARATE from the actual Character in the University Store. Craft Seafoam Offerings at the Campus Altar to appease Neptune. 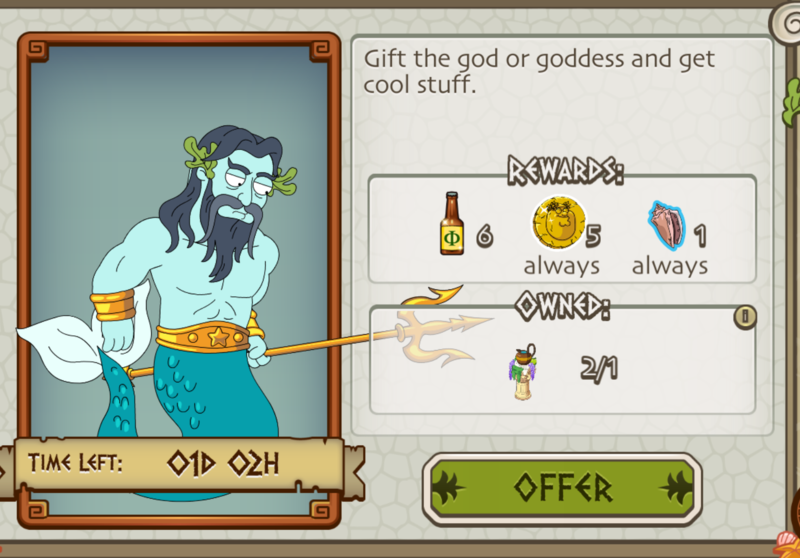 Once you have collected enough Seafoam Offerings, tap the “offer” button to make an offering to Neptune. Each time an offering is made, your streak counter will increase and you will earn greater rewards. You will have 36 hours to appease him by making 4 offerings. If his 27 hour timer reaches 0 before he is appeased, your streak will be reset. How do I get Xena? 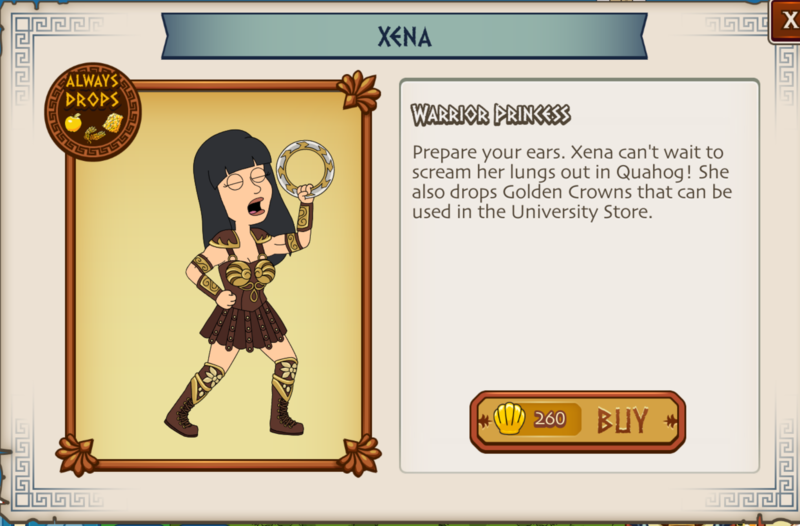 Xena is available in the shop for 260 clams. She will be available for purchase until Thursday, June 9 at 10 AM, PDT. You can view the Week 2 Hub here. Thoughts on week 3? Liking the additions? Sound off below.. This entry was posted in Buildings, Characters, Decorations, Game Play, Special Event, Tips and Tricks, Updates and tagged Family Guy Addicts, Family Guy Game, Family Guy Greek Life Week 3, Family Guy The Quest For Stuff, Family Guy Tips and Tricks, Greek Life Event. Bookmark the permalink. I cannot believe that 2 hours ago I bought a bin and crate of clams and now there is a deal for free crowns with a purchase of clams! First thank you for all of the help. I rarely comment, but I still read. I’m having a problem with Neptune. His timer ran down 2 days ago and he has yet to “awaken” again. I can’t finish bully Finn as he doesn’t seem to come back after he leaves the first time. Well, they extend the challenge by one day but waht good is it if Neptune stiil doesn’t return? Totally agree, it is not much use if it takes another day for him to actually come back into the game, they need to fix it so he comes back straight away for everyone and then the fix they issued will make sense. Wonder if they will extend the actual event as it also has an impact on the overall quest. They said to me that the fix will work *once Neptune respawns* but as you say … he WON’T respawn. I do buy clams but there’s no way I’m paying clams to sort out their glitch. It’s an unbelievable response, even for TinyCo. They need to unlock Neptune for us. It’s completely unfair. I’ve paid clams to hurry sacrifices to ensure I kill the correct amounts of Minotaurs etc and I’ve set alarms to wake up at night to restart things and now they’re saying that I have to pay my own bought clams to fix this???? I also didn’t get Neptune to return for the last 3 days. I need to give him 5 more offerings for the challenge and get more conchs for Finn. So I paid the 48 clams to get him back, made one offering, and he left. Now it wants 40 clams to bring him back again and it would most likely happen again. No, not happening. That’s disgusting – they should refund your 48 clams!!!!!! 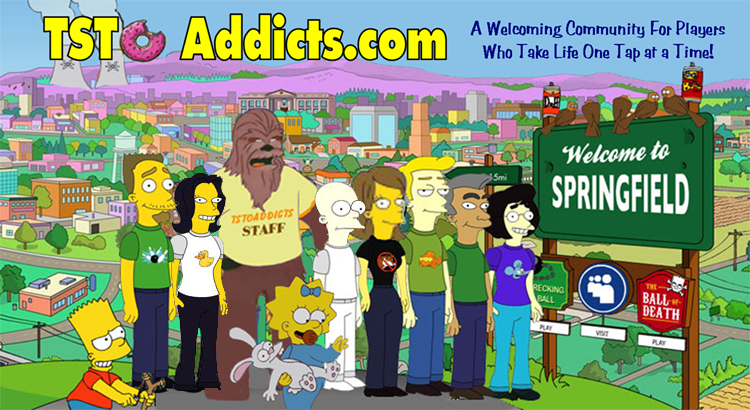 It is something that a site really won’t offer help with in the same regard as Family Guy. We MIGHT do a forum, but would need help from Community hosting and Admin it. We are spread too thin as it is. The golden crowns have pretty much stopped my progress on everything since everything needs them and I’m lucky if I get 1 or 2 for an entire day. Everyone seems to be complaining about the Neptune rescan rate, but it’s the golden laurel wreaths – or lack of – that are crippling me! I have cleared a dozen or so mermen and had nothing in return! Billy Finn has now ground to a halt and so has the quest line. Very poor! I already have Jesus in my game who drops 2 clams, but I’m wondering if I were lucky enough to get the football jersey outfit for him, does he drop 2x 2 clams (4 total)? I’m wondering this bc TC said that was the drop rate (4) when this outfit first appeared the Big Game event….wondering if it’s still like this. Thank you! Thank you Alyssa! Thank you Bunny! Thank you Everyone! Yes. It is 4 Clams WHEN it drops. Lol. I found myself that the 2 Clam Jesus seemed to drop more often. Could be me. Lol. Sweet! Thank you SO much Bunny! You’re such an amazing gal! Hope you feel superb soon! I had opened the box once and got Satan. Third and last try I think (I don’t want to risk it, lol) was Touchdown Jesus! I would be okay with getting Super Devil too, but idk if I wanna risk getting materials I may not use if I can’t even access phase 4, ya know? I’ve gotten a response from TC about Neptune (for whatever reason they get to me relatively quickly; I always stay polite, might be an issue for others :P) and they have indeed acknowledged the spawn issue is a bug, and a fix should be in place. What it does for other players I don’t know but after speeding him up and offering, he returned near instantly. They told me that until he returns by himself the patch will not take effect. As I’m not paying 48 clams for his immediate return it looks like I’ll fail the challenge. I got the same response from them. I also paid 40 clams for him to return, which brought him back for literally an hour. So frustrating. 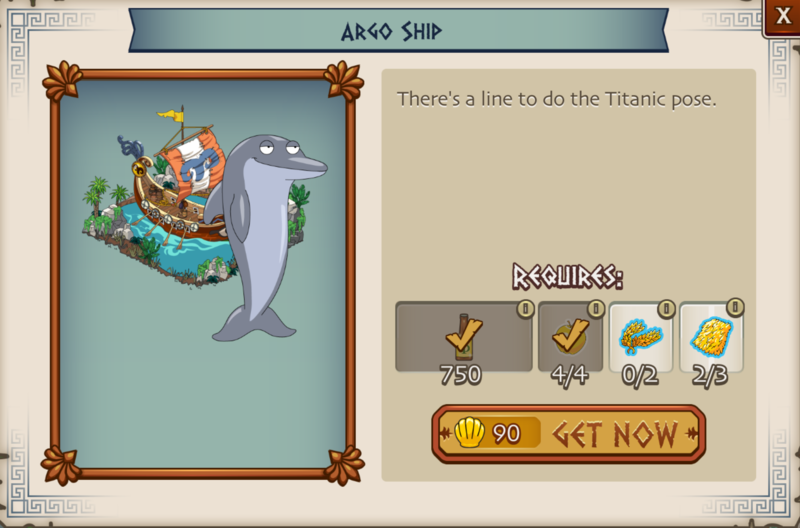 I’m going to miss out on the weekly quest and I’m delayed on the dolphin guy, and I’ve spent a lot of clams this event. Is there another way to get help from them besides the in-game option? Just in game and email. I have been in contact with them too. Nearly 24 hours since I received the “fix” message from tinyco and still waiting. Neptune still a no-show. I messaged again to Sal them to check my game to see if the fix worked, we’ll see if/when they respond or Neptune shows up. Only thing left for 3rd challenge is 6 offerings… ARRGHH. So close. Still have 11 shells and 9 fish Jesus left for Finn and I’m good for phase 4. I did get the Neptune character though which is pretty awesome. It was easier than I expected, I had over a day left on his timer. I am really happy! I got him right now too 15 hours before the timer is over. And I did it completely freemium. 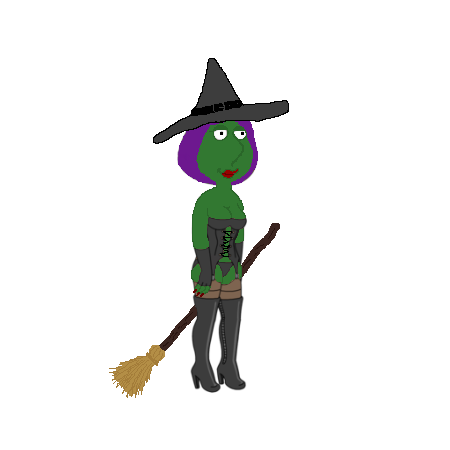 But I had to postpone the execution of the main quest in order not to waste ambrosia on all of these useless buildings and now I have to catch it up and need a Roman candle shop. But now with Neptune it would be easier because he is already working on seafoam! As for the challenge, I need to make 3 offerings to Neptune & clear 8 minotaurs. Everything else is done. Same problem as many are reporting here. Haven’t seen Neptune respawn in over 3 days now. Clearly a huge issue considering this week’s challenge and the need for shells to complete Bikly Finn/Main questline. Have reported it as many others have yet no acknowledgement. So tired of the bugs in every event. Embarrassing. Had the same problem earlier in the week. After two days of waiting, I clammed up and started him over. Haven’t had any problems since; no more than 2 hours of downtime when he goes off to regenerate. It is strange, but as for me I don’t have the same problem… Neptune respawned I think, 3 or 4 hours after he escaped. I am having the same problem – it has been 3 days for me as well. I contacted TC and received the following: We have pushed a fix that we believe resolves the issue with Neptune taking longer than intended to reappear. This only affected players who had defeated Neptune and not those who had his timer reach 0. Please note if you are currently waiting for him to reappear after defeating him, you will need to wait for him to return for the fix to take effect. It should not take longer than about 24 hours after defeating Neptune for him to reappear. In my case I didn’t defeat him fully, I just didn’t have enough time to get seafoam & stopped one step from defeating him when the time was up. So it was luck for me because I didn’t have any problems with him to respawn then. Same reply I got. 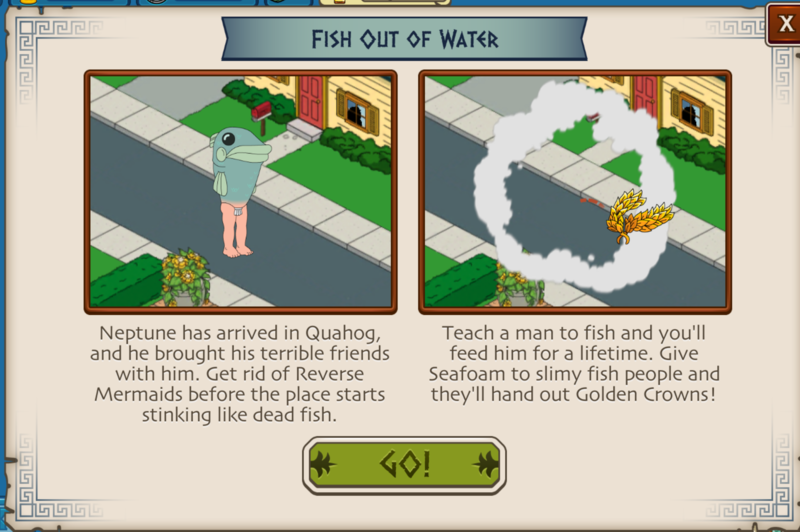 Doesn’t help much though as he probably won’t respawn until after the timer runs out, and I shouldn’t have to pay clams to bring him back. My first challenge that I won’t complete… still need conch shells too. That is rubbish though as I never defeated him but he has been gone for 3 days, don’t get the 24 hour bit though and if you have to wait for him to reappear before the fix takes place, how long is that actually going to take, just seems so open ended. Sigh… Still no Neptune now about 28 hours after the message about the fix. Got s response when I messaged again s few hours ago… Yep, a repeat of the same message. Great! Funny that when you update the fountain (spoiler alert) it is broken looking… Kinda like – no I’m venturing into WTD territory. Anyway – enjoy week 4, hope to join you at some point! Neptune never showed up for me. My fountain is done at level 4 and I got actual Neptune. But a task says to make 6 sea foam offering and I can’t do it. Any thoughts? Are you to Capacity in the Campus Altar? You can’t make more if you hit your Capacity. Have to clear out some of the other items you created in order to be able to make more. Thank you to all my replies on here regarding the mistake made by The Quest for stuff in week one of Greek week. I now know there is an incorrect image of a 2 X golden crown drop in the dionysus’ wine shoppe in the University store. which apparently drops green laurel wreaths. This means I have purchased an unnecessary building and I shall be referring this to customer service. I don’t expect a reply as I have not had a reply to my last 3 messages sent to them. I truly appreciate your website which after posting my concerns on here, I was inundated with replies and explanations within a few hours. Thanks. This is a great idea. I will open a ticket also. Even if it can’t be fixed, they should know the issue. I also got it unnecessarily. I even triple checked the pick. Thanks for that- well said and good perspective. Sorry to those of you that thought that, but I don’t remember other buildings in any other event that were designed to be multipurpose this way. Just is something tinyco wouldn’t have done IMO. Geeze take it easy on them cornishdude it was an honest mistake and tinyco should’ve done their part to help avoid it to. Yes, I’m mean. It’s my job in real life to see and explain facts, regardless of feelings, and I excel at it most of the time. Is your grass also gold? Like boomsday? sheesh, green is not gold. Period. Never will be. Tinyco has nothing to do with that, it’s science. NEPTUNE?! He’s been out of my game for at least 3 days now and I’m becoming concerned I may not be able to not only complete challenge #3, but also complete phase 8 (finish Finn) since I can’t do the sea foam offerings. Zeus and hades return within a couple hours. I’ve messaged several times but no response yet. Anyone else seeing similar pattern? Yes, I’m having the same issue. Yes. I’m considering spending Clams, only 12, when the time is dire to speed it up but it feels ridiculous it’s required. I’ve just forced Neptune to spawn, but I will consult with customer support as to whether they can do something about the Clams spend. This problem seems to be widespread. Only 12? Mine says 40 clams to respawn. I’ve spent money this event because I like the theme, so it’s really annoying to hit a roadblock/paywall at this point. At least I’m not the only one, I guess. It seems to matter to what level you “appeased” the god before the timer runs out- the god returns at the same level you stopped offerings. But the higher the payout level- the greater the clam cost to bring them back. I’m wondering if they used similar coding as with the princess bride event with dragons where the “blue black” one seemed to appear with less frequency- as does Neptune? Who knows- but it had been much less of a grind knowing that the gods were going to return more quickly… At least until we hit Neptune. Yep. I received the same message about it being fixed and it shouldn’t take more than 24 hours. I almost didn’t do the 3rd challenge just because I needed a break. Unfortunately, I changed my mind. Now may not be able to finish due to this problem. Which would mean we may not get the grand prize. They may need to just award the challenge to all that completed all but Neptune. Guess we will have to wait and see. 6 offerings to Neptune = 7hr/Seafoam if back to back (all + first two). This makes a total of 48.5 hours which is perfectly managable. In fact, the majority of these requirements would have been met regardless for Crowns and Fleeces; I’m glad I’ve gotten the phase 3 Apples beforehand as I didn’t expect Zeus to be part of this challenge. You’d want to do Neptune back-to-back to speed up his spawn. Mind that of all of this only Ambrosia offerings are truly suboptimal, so that’s half a day wasted. Only issue I see if for some of us Neptune is not spawning, been gone for almost 3 days for me. Yeah, I’m in the same boat, when I posted the durations I was still in the assumption Neptune would spawn this morning. Looking at some cries for help in this thread, it seems to be bugged. Actually… I think many players are having this issue, but only NOW it starts to become a dire issue. Most probably cleared him fully once, and as Billy Finn is going to be the bottleneck for phase 3’s part 8 players start to wonder why they can’t get their last 4 Conch Shells. Add to that the six offerings for the challenge, and sh*t hits the fan. I’m in a worse spot with just 1/14 shells as I needed ambrosia faster, so IF they fix it I’m gonna need an instant respawn to get week 4 on time, this is all I have left to do now. Reported with no reply. Has anyone had Neptune respawn at all? Can anyone tell me how long the King Midas Cash 4 Gold task is for the Hood ornaments? Hello, I very rarely leave a comment, but I was wondering if anyone else had opened the dionysus’ wine shoppe in the University store in week one, it promises to ALWAYS drop 2 X golden crowns every 4 hours, but I have not had a single golden crown dropped yet in the past 14 days of opening it…? I was wondering the same thing. I haven’t had any drop from it either and I can’t find an answer about it anywhere. Hi these are for the laurel crowns which were required to unlock peter in week 1 not the currently needed chosen crowns unfortunately. Hi, Same thing with me. Zero drops. If I check the payout, where I can speed up with clams, crowns aren’t even listed. Seems a defect to me. Are others getting drops? The wine shoppe dropped laurel wreaths to help unlock Toga Peter not golden crowns. … still have no response. Wrong crowns, I think week one were laurel wreaths, just a similar image. You might have already found out by now – if you get the football Jesus costume from the mystery box but don’t have Jesus, it will take you to Al’s and look like you’re out of luck. If you look in your inventory though, Jesus will be there… You can place him, unlock him, the. Go back to Als to finish the costume. Week three challenge will be hard to reach if I choose to get any sleep in the next 2 days and 21 hours. I’m going to need this game constantly being created. Clear 14 Reverse Mermaids (Mermen, really, but that’s what it says in game). It is for the weekly challenge. A lot of clearing – 14 reverse mermaids, 18 minotaurs, 12 centaurs and 6 offerings to Neptune. It has a 3 day timer. The prize is Hippocampus – a serpent like horse. I would message them in-game, bc mine respawned in a few hours…I think around 4-5 hours. Dang, I still need 4 collars. Boo. I am thoroughly confused – people are talking about Neptune and I haven’t gotten anything past Hades. I have auto-update on. Any ideas? I would hate to miss out on something! Did you finish the week 2 questline? Think so, I still don’t have tri-bri though so if he’s essential for it I guess I am kind of screwed.